In compliance with the provisions pursuant to art. 13 D. Decree 30 June 2003, the M.P.T. 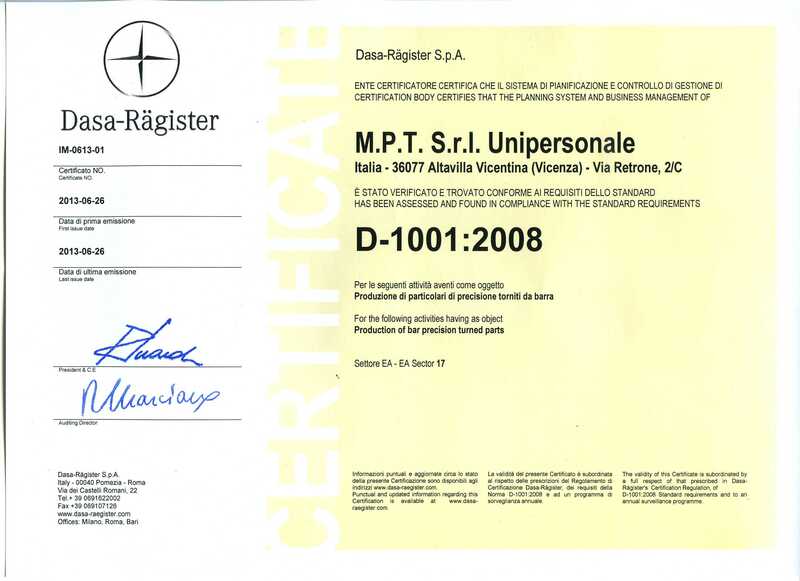 Unipersonale SRL, with registered offices at (36100) Vicenza, Via D. Meschinelli 90 and its operational headquarters in (36077) Altavilla Vicentina (VI), Via Retrone n. 2 / C- Italy, inform the subjects that require information on what are the purposes and methods of processing of personal data collected, their scope of communication and distribution, as well as the nature of their contribution. The personally identifiable information, consisting of name, surname and email address, collected from interested parties, subject to processing, are used in full compliance with the principles of lawfulness, fairness and the provisions of the law in order to fulfill the request for information. The data may also be used, subject to consent, to send informational messages and commercial and promotional communications related activities and services offered by the owner. The processing of data will be done by paper, computer and data by special internal persons. The data are stored in electronic archives and, residually, paper with full assurance of minimum security measures provided for by the legislature. The data collected will not be distributed, sold or exchanged with third parties without the express consent of the person concerned, unless any communications to third parties authorized – Committed to confidentiality or if charge of data processing art. 29 of Legislative Decree no. 196/2003- (such as computer support company) where necessary for the purposes set out in this statement. The person concerned may exercise their rights as expressed by. 7, 8, 9 and 10 of Legislative Decree no. 30th June 2003. 196 by contacting the data controller by sending email to info@www.mpthitech.com. In particular, according to art. 7 the party can obtain confirmation of the existence or not of personal data concerning him, even if not yet recorded, and their communication in intelligible form. You have the right to be informed: a) origin of personal data b) the purposes and methods of treatment c) the logic applied in case of treatment with the help of electronic instruments d) of identity of the owner, manager and the representative appointed under article 5, paragraph 2 e) the subjects or categories of subjects to whom the personal data may be communicated or who can learn about them as appointed representative in the State, managers or agents. You have the right to obtain: a) updating, rectification or, when interested, integration of data, b) the cancellation, transformation into anonymous form or blocking of data processed in violation of the law, including those which need not be kept for the purposes for which the data were collected or subsequently processed c) certification that the operations in letters a) and b) have been notified, as also related to their contents, to those to whom the data were communicated or disseminated, unless this requirement proves impossible or involves a manifestly disproportionate to the protected right. You have the right to object, in whole or in part: a) for legitimate reasons to the processing of personal data, even if pertinent to the purpose of collection b) the processing of personal data concerning him for the purpose of sending advertising materials or direct selling or for carrying out market research or commercial communication. The data are kept for the time necessary to interact with the concerned for the release of information. In the event that the applicant pay your consent to send informational messages and commercial and promotional communications related activities and services offered by the owner, the data will be kept for no longer than two years after registration of personal data the same, except opposition of ‘concerned. The conferment of data is optional, but yet the refusal to respond will make it impossible for the holder to act on the requests for information made by the person concerned.